“Here comes the sun and I say, its all right.”-The Beatles. Except when that sun is shining through a window or skylight in your home or church and starts fading your expensive carpeting! Sun faded carpet is the worst! “Sun, sun, sun, here it comes.” OK enough Beatles references. Who’s ready to learn about sun faded carpet and how The Carpet Chemist can permanently restore the color loss? Most carpet contains all 3 primary colors in different amounts of dye when it is manufactured at the mill. Magenta, Yellow, and Cyan. The most dominant of the three colors is Cyan, then Yellow, then Magenta. In that order. When the sun comes in through a window or skylight and beams down on your expensive rug or carpet, it will attack the weakest color first. Magenta! Magenta. Magenta, or red, is the first color that is subject to sun fading because it is the weakest of the three. When red is removed, yellow and blue are left remaining, which create a green hue. Yellow. Once the red is removed, the sun will start removing the second weakest of the three primary colors, yellow. You will start to see the sun faded area become more blue or Cyan, when this occurs. Cyan. Cyan or blue, is the most dominant of the three primary colors, and it takes a lot of constant sunlight to start removing this color. Once it gets to the point of removing the last primary color, you will see a light blue hue in front of the window or area where sunlight is beaming down. Have you ever noticed how quickly a red patio table umbrella or a red outside seat cushion or pillow will fade? Well the same concept applies here. If you have a beige carpet in your front sitting room in your house, with a window that allows sunlight to beam in, down on your beige carpet, you will eventually notice the color shift from beige to light green over time. But only in the areas where direct sunlight is constantly touching the carpet or rug fibers. If this continues over several more years, you’ll notice the yellow hue fade away and a light blue area will be noticeable in front of the window. 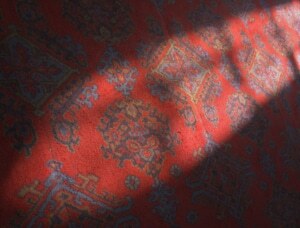 The Carpet Chemist says: Rotating your Oriental/Persian rugs 180 degrees once a year will help prevent sun fading spots from appearing. Having UV protection on the windows of your home will not only keep your home cool in the dead of the summer heat, but will help protect your carpet’s color. Shades and blinds are another helpful source for blocking the sun’s harmful rays. When you send us a pic of your sun faded carpet, we will assess how much color loss there is and formulate an exact color match to restore your faded carpeted areas back to the original color. We utilize a proprietary technology called the ColorCue, which is an app which allows us to upload a pic of the color loss into the app and upload a pic of the target area (the color of the undamaged carpet). The app will automatically calculate exactly how much of which colors are needed to dye the damaged areas. This method is revolutionary and light years beyond carpet dyeing techniques you might find online, or dyes you might find in your local grocery or craft stores. It completely takes the guess work out of dyeing the carpet to an exact match. Just upload a pic of your sun faded carpet or rug, at the bottom of the contact form below, along with your contact info so we can see the exact issue you are dealing with. We will evaluate the color, the size of the area that needs to be dyed, how many spots, etc. Our IICRC-certified team provides no-obligation estimates. Connect with our team at (800) 515-1342 or by using the secure form below.